Relying on others? When You Can't Be There. TaskAssure! Do you rely on others to perform tasks when you won't be there to watch? What if you could keep informed while your tasks are performed? TaskAssure® monitors tasks and keeps you informed. 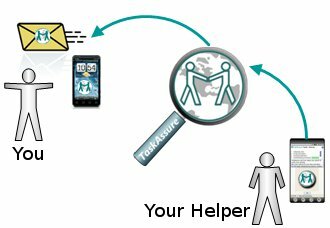 Patent-pending TaskAssure is actually a simple idea: you create task assignments for your helpers, which are sent to their TaskAssure mobile phone app. When a helper performs a task we use sensors in their smartphones to verify activities, and keep you informed about progress. See our video "Introducing the Power of TaskAssure"! 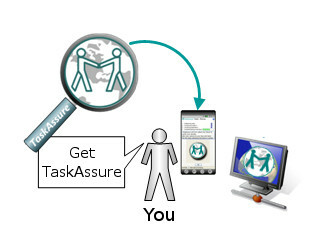 How do you TaskAssure a service? The simplest way to start using TaskAssure is to get our mobile phone app and Sign Up. Or, you can Sign Up here now to use the website. Assign tasks to your helpers. If they don't have TaskAssure yet, we will email a link to get our app. 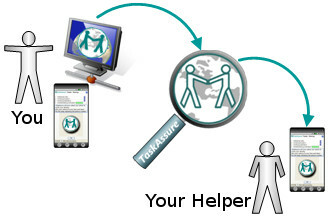 Helpers see tasks on their mobile phone app. 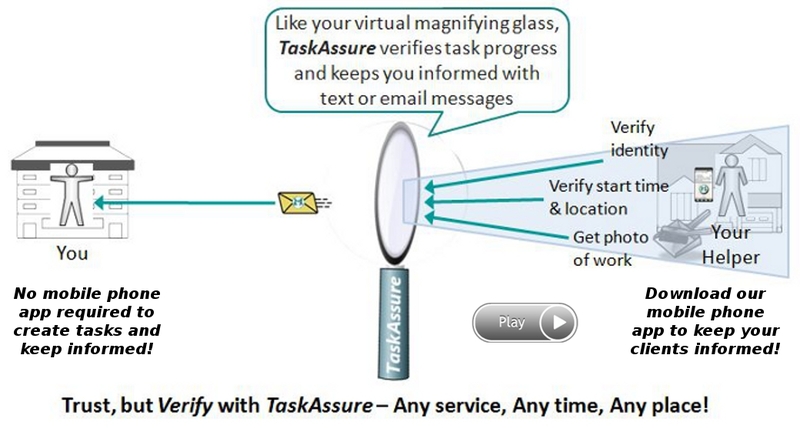 Your helper uses the TaskAssure app to update task status, and you receive verified task updates via email or text message!